Gadba gro-Largash is an Orc warrior found working in Narzulbur's Gloombound Mine. He stays inside the mine all the time, never eating or sleeping, though he occasionally sits for a break. He is originally from the Largashbur Orc Stronghold, but he left there the same time his brother Mul did. Gadba wears a pair of ragged trousers along with a pair of boots. He carries a pickaxe along with a leveled war axe, which can be up to Orcish in quality. Gadba seems to have a fairly simple outlook on life, pointing out that he just follows his brother: "Mul is the smart one. I go where he tells me." He finds mining to be a difficult task: "Mining is tough, but Mul says the money is good so we mine." 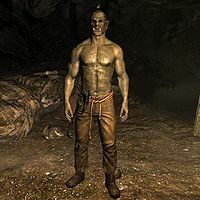 Along with his brother, he plans on returning to Largashbur someday, but points out that he may miss Narzulbur when they leave: "When we go back to Largashbur we'll be kings. I like Narzulbur, but don't tell Mul." This page was last modified on 21 April 2014, at 09:24.